From the hot cross bun department... Bun B @ Nice Kicks tomorrow, Nov 12th! 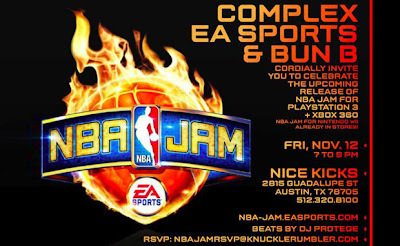 This Friday, November 12th, come out to Nice Kicks for the official launch of NBA JAM for Playstation 3 and XBOX 360, presented by Complex, EA Sports and Bun B. From 7 to 9 PM, all attendees will have an opportunity to check out the revamped classic game, enjoy free food and drinks and hang out with the Trill OG himself. There will also be plenty of giveaways and DJ Protege will be working the turntables. RSVP at NBAJAMRSVP@KnuckleRumbler.com and make sure to wear your favorite retro kicks. Bernard Freeman (born March 19, 1973 ) better known by his stage name Bun B is an American rapper and was one half of the southern hip hop duo UGK. He is also a guest lecturer at Rice University located in Houston, Texas. He recently released his third official solo album Trill OG on August 3, 2010, which received a 5 Mic "Classic" rating in The Source Magazine - the first album in over five years to receive the honor. Bun B is married with two step-children. When Bun B's UGK partner, the late Chad "Pimp C" Butler entered a jail sentence on an aggravated gun assault charge in 2003, Bun B made guest appearances on numerous albums by other Southern rappers and released a 2005 mixtape titled Legends. Singles featuring a Bun B guest appearance included "They Don't Know" by Paul Wall, "Gimme That" by Webbie and "I'm A G" by Yung Joc. Bun B also appeared in a documentary titled Screwed In Houston produced by VBS/Vice Magazine that details the history of the Houston rap scene.